Our first trip to Utah this fall started out in sunny St. George as I met our 5 guests for a pre-trip meeting at the hotel before a delicious dinner in town. Our guests were excited to see Zion and Bryce Canyon National parks, as most had never been to this part of the country before, and looked forward to seeing some new sights in this overwhelmingly vast part of the southwest. We began with an early morning as we had about an hour to drive to the park before shooting the Towers of the Virgin, a stunning introduction to Zion, made up of sheer cliff walls behind the park’s human history museum. We shot the cliff walls as the fingers of the first morning light crept down the massive sandstone features. Quite the impressive first look in the park. 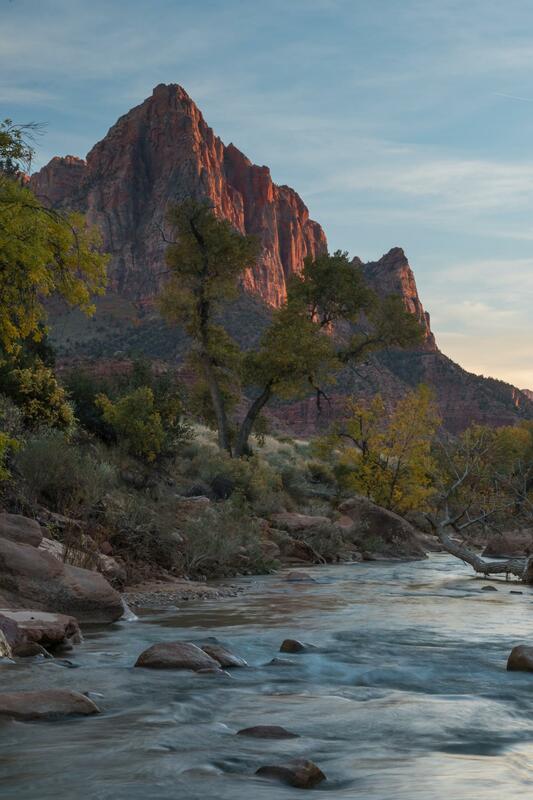 Later that evening, we ventured down to the water’s edge along the Virgin River to shoot the Watchman at sunset, with an opportunity to capture an alternate angle at an already very famous landscape scene. We had great light and some high wispy clouds as the leaves in the canyon had just begun to turn yellow. 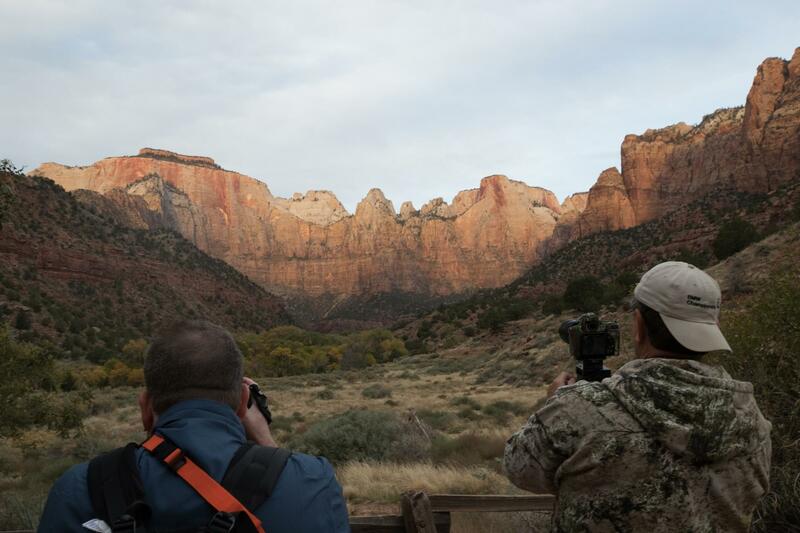 The following morning, we had grand plans for a long range landscape shot on the upper Kolob Terrace. A great place to get out of the crowds of Zion and see some more unique landscapes, I’d highly recommend going up there the next time you’re around. Unfortunately for us, we had a low lying band of clouds that all but obscured the sun until well after golden hour. Our light was flat and grey all morning before the sun got high enough to burn off the clouds and gave way to a clear and sunny afternoon. Nonetheless, our guests enjoyed getting to see a side of the park that few people get to, and we enjoyed what essentially became a leisurely morning drive. 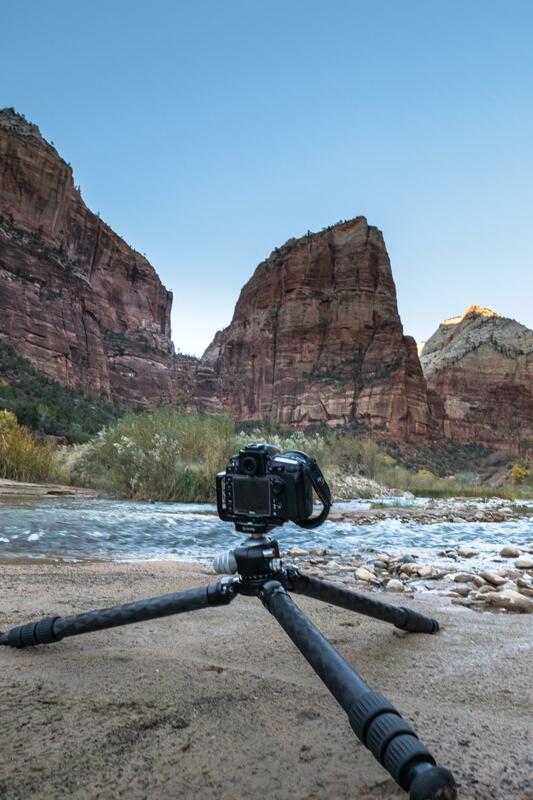 That evening, we went out to Angel’s Landing, again along the Virgin River to get another classic Zion photo. Our sky was clear and a bit uninteresting, so our group elected to call it an evening after only a half hour of shooting the famous monolith. But our day would not end there, as we headed out again after dinner to the nearby ghost town of Grafton where we worked on light painting and some unique, albeit creepy night photos of an abandoned schoolhouse/church the night before Halloween. We had clear skies and a beautiful look at the Milky Way, and everyone was excited to play with some long shutter speeds and see what sort of astrophotography we could come up with. Our last morning in Zion, we awoke early to make the first shuttle pick up to go out to the Court of the Patriarchs. Another famous set of sandstone towers, the Court of the Patriarchs get some great morning light and give an astounding sense of scale as the sun creeps down the rocks first thing in the morning. After heading back to the hotel for breakfast and a chance to pack, we left Zion en route to Bryce Canyon National Park, stopping along the way in beautiful Red Canyon for a picnic lunch. That evening, we headed to Sunrise point for Sunset (ironic, right?). In Bryce, Sunrise and Sunset points aren’t named for the best place to see the sunrise or sunset, but rather for the stops where the passenger train used to drop off visitors at sunrise to be picked up later at sunset. A vast majority of park visitors don’t know this, and as a result, Sunset Point is often very crowded at sunset, while Sunrise point gives an equally unobstructed view of the park as the colors change at sunset, without the crowds. The following morning our group got up well before sunrise to head to the very beautiful Bryce Point. We braved cold and wind as winter began to set in in southern Utah. We had some interesting clouds on the eastern horizon that helped to make our sunrise shots a bit more dramatic, the first such clouds at sunrise of the entire trip. Later that afternoon we ventured down into the hoodoos and shot at the famous Wall Street switchbacks, and the more adventurous of our group went to the bottom of the hill to take a few more shots. Bryce is certainly the sort of place that can continue to pull you deeper down the longer you look for photos. After a warm dinner, we called it a night, excited for our last morning together and anxious for what the weather might bring. Our final morning brought clear skies and slightly warmer temperatures as we made our way to Inspiration Point for our last shot. The entire group spread out along the canyon rim and we awaited the sunrise. We were able to capture a beautiful sun burst shot right over the hoodoos for a great panorama. After our morning shoot, we went to breakfast to warm up and reminisce about a great week together before our long drive back to St. George.